Steele Canyon H.S., 12440 Campo Rd. 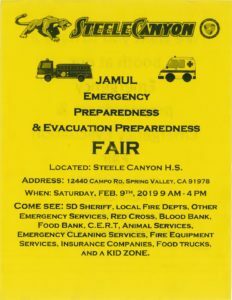 Come see: SD sheriff, local fire departments, other emergency services, red cross, blood bank, food bank, C.E.R.T. animal services, emergency cleaning services, fire equipment services, insurance companies, food trucks and a kid zone!